My friend Hilary had told me that her husband was hooked on these cookies, however they are $8 for a package. They are sold by Tate’s Bake Shop in Whole Foods and everywhere. I was determined to find the recipe and I did! I had to download the cookbook but I think it was worth it! However, the author neglected to tell you how many pecans to put into the recipe. I used 1 cup and think it is perfect. This is a rather flat cookie but so flavorful. *I did not have instant oatmeal, so I just processed the half cup in the food processor. I recently adjusted this recipe from the original and like it much better. Any cookie dough benefits from being chilled for a day before baking. I added an extra 1/2 c. of oats (1 cup total) for a fluffy cookie and it was perfect. However if you are making Ina’s mocha chocolate icebox cake, use the flatter cookie. Preheat oven to 350. Line two cookie sheets with parchment or grease them. Combine flour, baking soda and oats in a large bowl. Cream butter and sugars til creamy. Add egg and mix well. Add vanilla, scraping down the sides of the bowl. Add flour mixture and mix until combined. Do not over mix. Stir in the toffee bits and pecans. Make cookies about 2T. size. 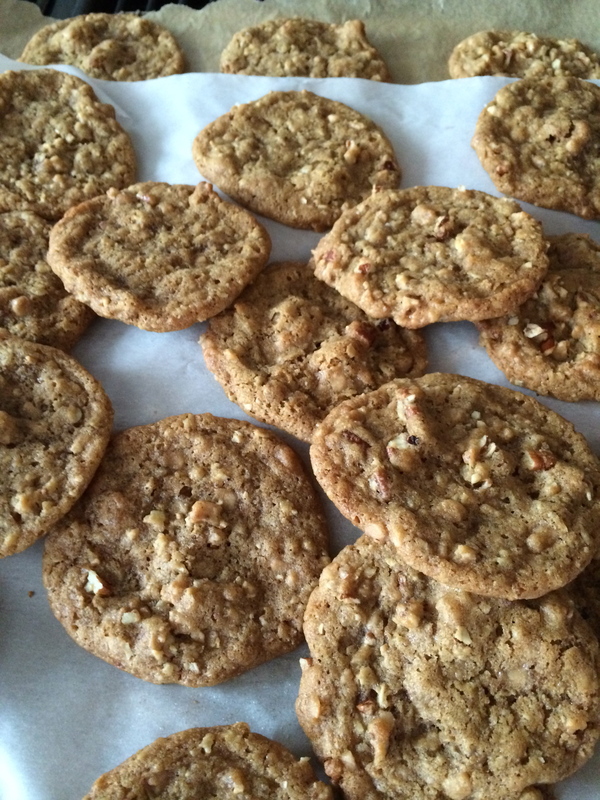 Bake 12-15 minutes for chewy cookies and 18-20 for crunchy cookies. I prefer them cooked for 18 minutes after experimenting.